ShiftBuster is an iOS app that allows you to share your shift pattern with your friends. You can enter a fixed shift pattern and the app will work out your schedule for the year. Exchange the data with friends using Facebook, and see who's on, and who's off using a simple calendar view or overlay 2 friends' shifts on top of yours. ShiftBuster is flexible so you can share just with your partner, or with 100 colleagues. It's up to you! Requirements: Compatible with iPhone and iPod touch. Requires iOS 8.1 or later. WiFi, or mobile data sometimes required. 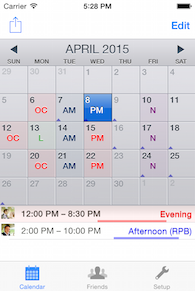 Easily add in your different shifts then assign them to days on the simple Calendar screen. Add friends from Facebook, then once accepted you can view their shifts month-by-month in a calendar view. You can import your colleague's shift types to get started quickly! You can choose up to two friends to overlay on your main calendar screen, so you can easily see when your shifts overlap, or when they are off at the same time as you are. Your app is simple, straight-forward and obvious. Clever too. I use it to keep track of my girlfriend! I added my work pattern for the next year in seconds, it's so easy to see what I'm doing months in advance. Makes planning an outing with my awkward friends a piece of cake. Even though they work such unpredictable shifts! I always used to hate organising anything with my doctor friends, but now I can find a convenient weekend in seconds. At last! I no longer get nervous when asked if my wife and I can make a weekend event! One click and I can see what on earth she's doing months into the future! We provide community support via our public Facebook page. Do my friends need the app? Yes. Your friends need to have the app in order to see your shifts. We hope to make the data available outside of the app if there is enough interest in this feature. Please voice your support at our Facebook page if you think this is an important addition to the app. No. ShiftBuster is currently only available for iOS devices, although we are planning to develop an Android version very soon. Can I add a shift pattern? You can add a pattern of shifts (for example 3 Earlies, 4 Lates, 4 Off) using our tool in the app. This will add your shifts for one year, you can add them again if you need to go further into the future. Are my shifts backed up? Once you connect the app to Facebook, all your shift data is sent to our servers where it is stored securely. This is necessary to provide access to the data to your friends and also gives you confidence the data is backed up in case your device fails. This feature also allows you to use multiple iOS devices with the app at the same time. We make apps that help you sort out your complicated life. ShiftBuster was designed to help people with friends who work pesky shifts arrange their social lives by making it easy to figure out when their friends are working, when they're off, and when they're likely to be able to come out for that special meal - or just to the pub after work. Hopefully ShiftBuster realises that ambition by offering flexible, but secure, data sharing, and also helps you keep your own life organised, carefully synced between all your devices. ShiftBuster is in its infancy and we hope to make many improvements to the app over the coming months, and welcome your feedback and support on our Facebook page. Copyright © 2015 Tony Johnson. All Rights Reserved.